On the east side of the King's Highway, just south of Sloptown Road, a built-up gravel ridge supporting the narrow Mooney's Trail runs through a cedar woods all the way to the wet fields behind Dan Gallagher's house on the East Side Road. 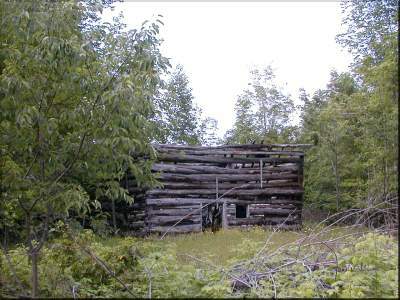 At the one-third point we came upon the first of three clustered buildings, a frame house of relatively recent origin -- perhaps 60 to 65 years old. 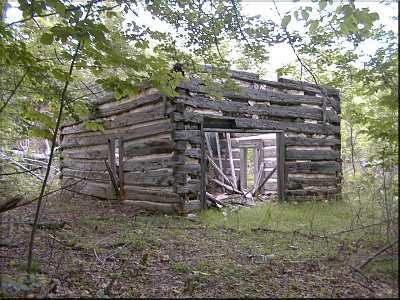 Another 100 yards eastward, there was the fading remains of a large old two-story log cabin. The walls are still there, but the roof and second floor have fallen in. The inner plaster still adheres to some of the walls. Another 100 yards northeasterly, we came on a smaller log cabin that might have been made into a barn: an 8'-wide door had been installed in the south wall. It was sided with cedar shakes, as can be seen on the north and east sides, and had the same plastered-over "domino" chinking of square wood "plates" that we had seen elsewhere. 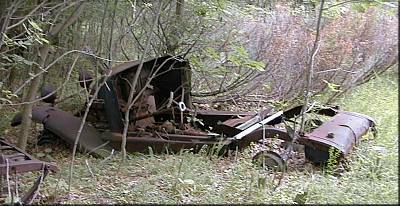 Nearby holes may have accomodated a log-lined well and an outhouse, and the remains of 20's-era cars are scattered in the nearby woods. Fields once worked lie fallow to the south, now overgrown with junipers; one of many nearby rockpiles indicates the effort it took to clear them. We called LaDonnis Mooney Tuesday night (7-7), but he could not tell us much. "They were Mooneys, but not related," he said. "The last residents were a brother and sister. She was blind, and used to guide herself along a strung-up clothsline to her henhouse to pick up the morning's eggs. Peter Doney used to talk about visiting them." Their trail ran to his homestead at Little Sand Bay -- now owned by the Nature Conservancy. There may have also once been a trail running south to "White Dan" Greene's, but, if so, no trace of it remains. Content & Images © 1999-2017 Beaver Island.Net. All Rights Reserved.